This study investigates the notion of limits to socioeconomic growth with a specific focus on the role of climate change and the declining quality of fossil fuel reserves. A new system dynamics model has been created. The World Energy Model (WEM) is based on the World3 model (The Limits to Growth, Meadows et al., 2004) with climate change and energy production replacing generic pollution and resources factors. WEM also tracks global population, food production and industrial output out to the year 2100. This paper presents a series of WEM’s projections; each of which represent broad sweeps of what the future may bring. All scenarios project that global industrial output will continue growing until 2100. Scenarios based on current energy trends lead to a 50% increase in the average cost of energy production and 2.4–2.7 °C of global warming by 2100. 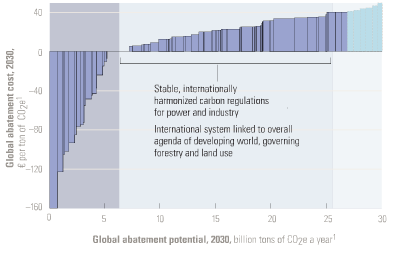 WEM projects that limiting global warming to 2 °C will reduce the industrial output growth rate by 0.1–0.2%. However, WEM also plots industrial decline by 2150 for cases of uncontrolled climate change or increased population growth. The general behaviour of WEM is far more stable than World3 but its results still support the call for a managed decline in society’s ecological footprint. But quibbling over dates is to miss a key point of Limits to Growth: the model, and the book, are not about point prediction of collapse in year 20xx. The central message is about a persistent overshoot behavior mode in a system with long delays and finite boundaries, when driven by exponential growth. We have deliberately omitted the vertical scales and we have made the horizontal time scale somewhat vague because we want to emphasize the general behavior modes of these computer outputs, not the numerical values, which are only approximately known. Freepers seem to think that this means the whole SCC enterprise is GIGO. But this is not a case where uncertainty is your friend. Bear in mind that the deficiencies Pindyck discusses, discounting welfare and ignoring extreme outcomes, create a one-sided bias toward a SCC that is too low. Zero (the de facto internalized SCC in most places) is one number that’s virtually certain to be wrong. A kerfuffle is brewing over Richard Tol’s FUND model (a recent installment). I think this may be one of the first instances of something we’ll see a lot more of: public critique of integrated assessment models. Integrated Assessment Models (IAMs) are a broad class of tools that combine the physics of natural systems (climate, pollutants, etc.) with the dynamics of socioeconomic systems. Most of the time, this means coupling an economic model (usually dynamic general equilibrium or an optimization approach; sometimes bottom-up technical or a hybrid of the two) with a simple to moderately complex model of climate. The IPCC process has used such models extensively to generate emissions and mitigation scenarios. Interestingly, the IAMs have attracted relatively little attention; most of the debate about climate change is focused on the science. Yet, if you compare the big IAMs to the big climate models, I’d argue that the uncertainties in the IAMs are much bigger. The processes in climate models are basically physics and many are even be subject to experimental verification. We can measure quantities like temperature with considerable precision and spatial detail over long time horizons, for comparison with model output. Some of the economic equivalents, like real GDP, are much slipperier even in their definitions. We have poor data for many regions, and huge problems of “instrumental drift” from changing quality of goods and sectoral composition of activity, and many cultural factors are not even measured. Nearly all models represent human behavior – the ultimate wildcard – by assuming equilibrium, when in fact it’s not clear that equilibrium emerges faster than other dynamics change the landscape on which it arises. So, if climate skeptics get excited about the appropriate centering method for principal components analysis, they should be positively foaming at the mouth over the assumptions in IAMs, because there are far more of them, with far less direct empirical support. Last summer at EMF Snowmass, I reflected on some of our learning from the C-ROADS experience (here’s my presentation). One of the key points, I think, is that there is a huge gulf between models and modelers, on the one hand, and the needs and understanding of decision makers and the general public on the other. If modelers don’t close that gap by deliberately translating their insights for lay audiences, focusing their tools on decision maker needs, and embracing a much higher level of transparency, someone else will do that translation for them. Most likely, that “someone else” will be much less informed, or have a bigger axe to grind, than the modelers would hope. It is the developer’s firm belief that most researchers should be locked away in an ivory tower. Models are often quite useless in unexperienced hands, and sometimes misleading. No one is smart enough to master in a short period what took someone else years to develop. Not-understood models are irrelevant, half-understood models treacherous, and mis-understood models dangerous. Therefore, FUND does not have a pretty interface, and you will have to make to real effort to let it do something, let alone to let it do something new. I understand the motivation for this warning. However, it leaves the modeler-consumer gulf gaping.The modelers have their insights into systems, the decision makers have their problems managing those systems, and ne’er the twain shall meet – there just aren’t enough modelers to go around. That leaves reports as the primary conduit of information from model to user, which is fine if your ivory tower is secure enough that you need not care whether your insights have any influence. It’s not even clear that reports are more likely to be understood than models: there have been a number of high-profile instances of ill-conceived institutional press releases and misinterpretation of conclusions and even raw data. Also, there’s a hint of danger in the very idea of building dangerous models. Obviously all models, like analogies, are limited in their fidelity and generality. It’s important to understand those limitations, just as a pilot must understand the limitations of her instruments. However, if a model is a minefield for the uninitiated user, I have to question its utility. Robustness is an important aspect of model quality; a model given vaguely realistic inputs should yield realistic outputs most of the time, and a model given stupid inputs should generate realistic catastrophes. This is perhaps especially true for climate, where we are concerned about the tails of the distribution of possible outcomes. It’s hard to build a model that’s only robust to the kinds of experiments that one would like to perform, while ignoring other potential problems. To the extent that a model generates unrealistic outcomes, the causes should be traceable; if its not easy for the model user to see in side the black box, then I worry that the developer won’t have done enough inspection either. So, the discipline of building models for naive users imposes some useful quality incentives on the model developer. IAM developers are busy adding spatial resolution, technical detail, and other useful features to models. There’s comparatively less work on consolidation of insights, with translation and construction of tools for wider consumption. That’s understandable, because there aren’t always strong rewards for doing so. However, I think modelers ignore this crucial task at their future peril. 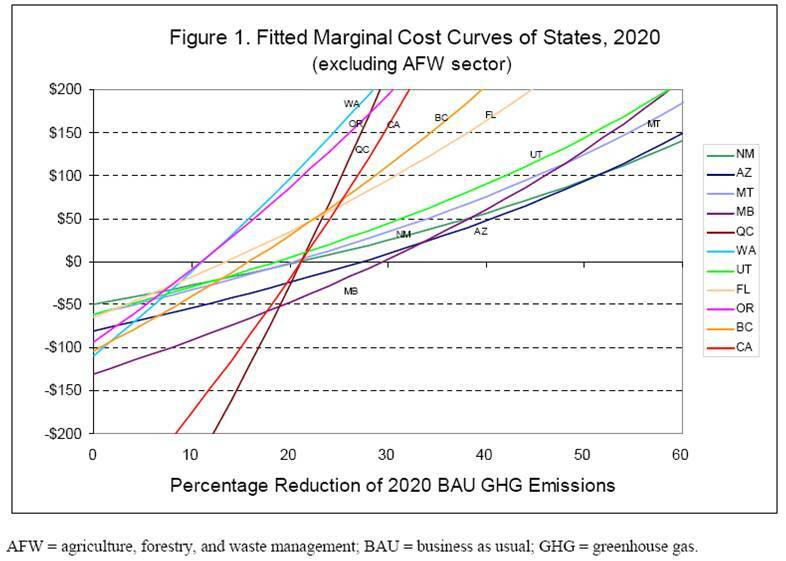 Marginal Abatement Cost (MAC) curves are a handy way of describing the potential for and cost of reducing energy consumption or GHG emissions. McKinsey has recently made them famous, but they’ve been around, and been debated, for a long time. 1. Negative cost abatement options don’t really exist, or will be undertaken anyway without policy support. This criticism generally arises from the question begged by the Sweeney et al. 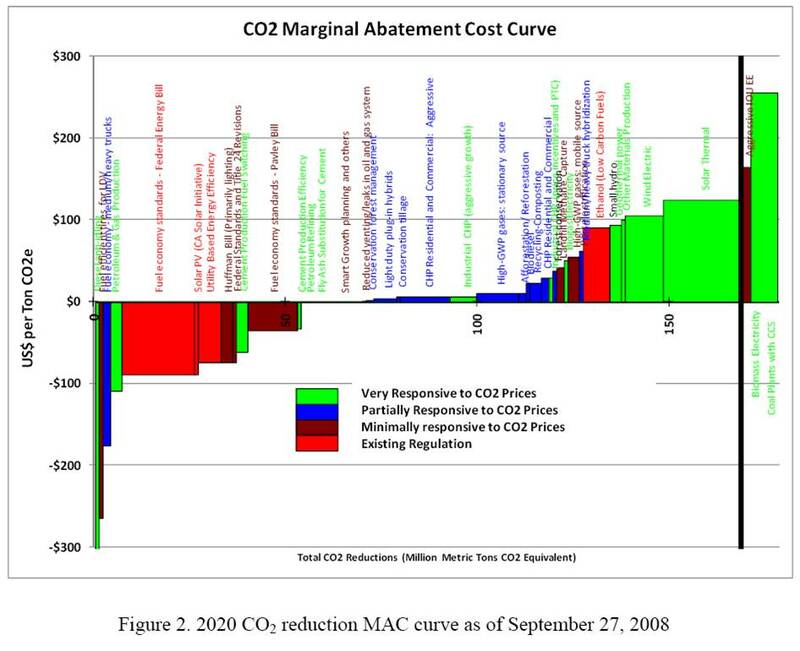 MAC curve below: if the leftmost bar (diesel anti-idling) has a large negative cost (i.e. profit opportunity) and is price sensitive, why hasn’t anyone done it? Where are those $20 bills on the sidewalk? There is some wisdom to this, but you have to drink pretty deeply of the neoclassical economic kool aid to believe that there really are no misperceptions, institutional barriers, or non-climate externalities that could create negative cost opportunities. Note that these are top-down implicit MAC curves, derived by exercising aggregate models, rather than bottom-up curves constructed from detailed menus of technical options. 2. The curves employ static assumptions, that might not come true. For example, I’ve heard that the McKinsey curves assume $60/bbl oil. This criticism is true, but could be generalized to more or less any formal result that’s presented as a figure rather than an interactive model. I regard it as a caveat rather than a flaw. 3. The curves themselves are static, while reality evolves. I think the key issue here is that technology evolves endogenously, so that to some extent the shape of the curve in the future will depend on where we choose to operate on the curve today. There are also 2nd-order, market-mediated effects (related to #2 as well): a) exploiting the curve reduces energy demand, and thus prices, which changes the shape of the curve, and b) changes in GHG prices or other policies used to drive exploitation of the curve influence prices of capital and other factors, again changing the shape of the curve. 4. The notion of “supply” is misleading or incomplete. Options depicted on a MAC curve typically involve installing some kind of capital to reduce energy or GHG use. But that installation depends on capital turnover, and therefore is available only incrementally. The rate of exploitation is more difficult to pin down than the maximum potential under idealized conditions. 5. A lot of mitigation falls through the cracks. There are two prongs to this criticism: bottom-up, and top-down. Bottom-up models, because they employ a menu of known technologies, inevitably overlook some existing or potential options that might materialize in reality (with the incentive of GHG prices, for example). That error is, to some extent, offset by over-optimism about other technologies that won’t materialize. More importantly, a menu of supply and end use technology choices is an incomplete specification of the economy; there’s also a lot of potential for changes in lifestyle and substitution of activity among economic sectors. Today’s bottom-up MAC curve is essentially a snapshot of how to do what we do now, with fewer GHGs. If we’re serious about deep emissions cuts, the economy may not resemble what we’re doing now very much in 40 years. Top down models capture the substitution potential among sectors, but still take lifestyle as a given and (mostly) start from a first-best equilibrium world, devoid of mitigation options arising from the frailty of human, institutional, and market failures. To get the greenhouse gas MAC curve right, you need a model that captures bottom-up and top-down aspects of the economy, with realistic dynamics and agent behavior, endogenous technology, and non-climate externalities all included. As I see it, mainstream integrated assessment models are headed down some of those paths (endogenous technology), but remain wedded to the equilibrium/optimization perspective. Others (including us at Ventana) are exploring other avenues, but it’s a hard road to hoe. The methods used to develop the various partner options differ, so these curves reflect diverse beliefs rather than a consistent comparison. What’s striking to me is that the biggest opportunities (are perceived to) exist in California, which already has (roughly) the lowest GHG intensity and most stringent energy policies among the partners. Economics 101 would suggest that California might already have exploited the low-hanging fruit, and that greater opportunity would exist, say, here in Montana, where energy policy means low taxes and GHG intensity is extremely high. For now, we have to live with the uncertainty. However, it seems obvious that an adaptive strategy for discovering the true potential for mitigation is easy. 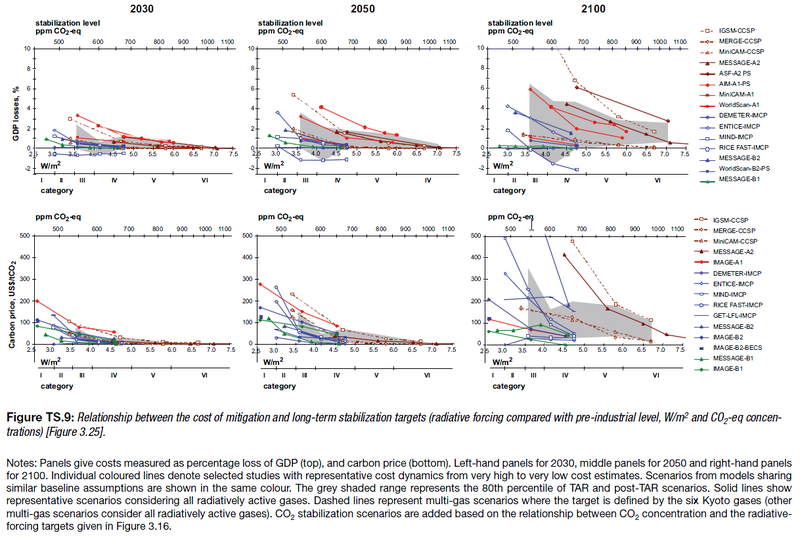 No matter who you beleive, the cost of the initial increment of emissions reductions is either small (<<1% of GDP) or negative, so just put a price on GHGs and see what happens. But it may be naive to assume that substituting for environmental systems is so easy. Feedbacks in the system may be such that as climate change unfolds, the return on capital and hence the discount rate falls. Environmental damage may slow or stop economic growth; if that were the case, we would not be much better off in the future. And if we are not so well off in growth terms, Nordhaus’s slower and more measured policy approach may not be so favourable over taking rapid action now. In other words, Stern’s conclusion might be correct, but not his derivation of it ’” right answer, wrong analysis. This is a crucial point. Richard Tol pointed out the substitutability problem back in 1994 but it hasn’t really found its way into formalization in mainstream IAMs. The issue of slowing or stopping growth isn’t limited to climate feedback; oil and gas depletion, the ever-present possibility of conflict, and degradation of other resources also impose constraints. Stern has been criticized for choosing discounting parameters that aren’t consistent with observed interest and growth rates. That’s true, but let’s not confuse the map with the territory. Stern’s choice is inconsistent with the optimal growth framework, but is the optimal growth framework consistent with reality? Clearly, market interest rates reflect what people actually do in some sense, but they do it in a rather complex institutional setting, rife with opportunities for biases and misperceptions of feedback. Do market interest rates reflect what people actually want? Unfortunately, the micro foundation of macroeconomics is too wobbly to say. Notice also that the equation above is underdetermined. That is, for realistic growth and interest rates, a variety of pure time preference and inequality aversion assumptions yield equality. Nordhaus, in his original DICE work, preferred 3%/yr pure time preference (no interest in the grandkids) and unit inequality aversion (doubling my income yields the same increment in happiness as doubling a poor African farmer’s income). Dasgupta prefers zero time preference on ethical grounds (as did Ramsey) and higher inequality aversion. The trouble with Nordhaus’ approach is that, unless the new book cites new research, there is no empirical basis for rates of time preference that heavily discount the future. It is difficult to create a realistic simulated context for such long term decisions, but the experimental evidence I’ve seen suggests quite the opposite, that people express some concern for even the distant future.